Turning Doctor Who Into an Action Game a "Tough Challenge"
Putting Doctor Who in an action game on the Nintendo Wii wasn't an easy task for Asylum Entertainment. Doctor Who is coming to the Wii in his own action-adventure game later this month (in the UK and Australia), but it wasn't easy for him to get there. When asked about the challenge of translating the typically non-combative Doctor into something Wii gamers would find exciting, developer Asylum Entertainment called it "tough." It might be easier to fire a bazooka at a Dalek or Cyberman, but that just isn't the Doctor's way. Instead, he outwits opponents or uses the technology found in his sonic screwdriver. On the topic of making the Wii's Doctor Who: Return to Earth exciting, Asylum's Glen Parry said: "This was indeed a tough challenge at first when designing the Wii game being that it is a 3D action adventure." Asylum has thankfully decided not to change the Doctor to add excitement, but to take advantage of his strengths instead. While players might not be firing weaponry at enemies, they'll be trying to get through the game by altering the environment with sonic blasts and through other methods. Parry continued: "However it was obvious that the sonic screwdriver is a wonderfully versatile tool, which suits the Wii Remote perfectly, and has the ability to fire sonic blasts which the Doctor can use to manipulate platforms, environmental hazards, fix circuitry, distract adversaries and more." The constraints put on Asylum apparently forced the studio to be more creative with Return to Earth's gameplay. "It also allowed us to emphasise gameplay aspects containing stealth, the environment and the use of distraction devices," Parry added. He says that Return to Earth's levels have multiple paths and to an extent allow players to complete them in various ways. As my colleague Andy Chalk points out, creating a Doctor Who action game is somewhat like creating a Freecell driving game: It doesn't initially make perfect sense. 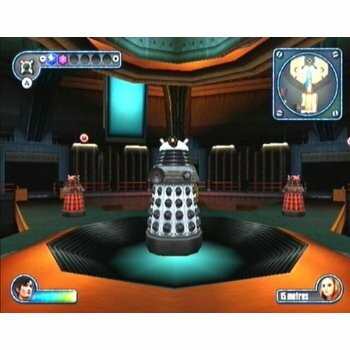 We'll see if Asylum has pulled off something special when Doctor Who hits the Wii in certain regions later this month.